A book about the joy of small science, Trilobite is itself a joy. Trilobites, shelled creatures known today only from fossils, were common in the worlds seas 500 million years ago, living in so many different ecological niches that they are known as the beetles of the Paleozoic. Fortey is a paleontologist, one of the worlds dozen or so trilobite experts, and a very fine writer. 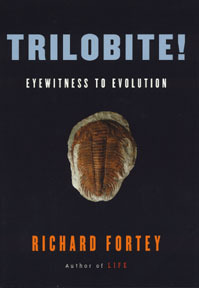 The history of trilobites extends through a time of great events in the history of life, and Fortey uses them as an eyewitness to evolution, an excuse to explore how evolution shaped the animal world. Fortey has other explorations in mind as well. What he is really interested in is exploring how scientists search for truth. With insight, clarity, and much joy he bounds from topic to topic, a scientist who really loves what he is doing. The beauty of the scientific life, he says, is that every honest practitioner may add a permanent contribution to the edifice of knowledge. Studying trilobites will not lead to a Nobel Prize, but clearly has been a source of intensely rewarding satisfaction to Fortey. It is fun to share his enthusiasm in this rewarding book.